The participants from the inaugural Global Citizenship Seminar – Sri Lanka pose for a picture at the end of their program. Editor’s Note: Skees Family Foundation began working with Educate Lanka in 2014. Educate Lanka has been an inspiring partner for us, which is why in 2019, we gave them our most prestigious grant, our two-year Catalyst grant. We have seen them grow and learn in considerable ways and we are so proud to call them our partners for opportunity in Sri Lanka. Educate Lanka has worked toward this mission with a growing, multi-pronged approach. 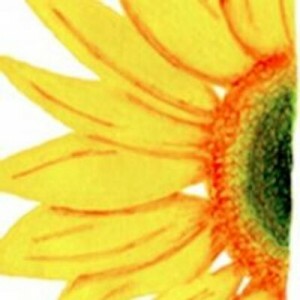 They have an online micro-scholarship model, which provides a peer-to-peer long-term funding and feedback platform that connects micro-philanthropists from around the world with their students. Complementing the funding, they provide mentoring and guidance throughout their academic lifecycle. Finally, Educate Lanka equips them with professional exposure and immersive experiences, skills training, and employment connections through its various levels of shared-value corporate and institutional partnerships both nationally and globally. Since partnering with them in 2014, we’ve seen them jump hurdles, surpass all expectations, and gain increasing momentum throughout the nonprofit community in spite of the less than ideal political and economic environment in Sri Lanka. 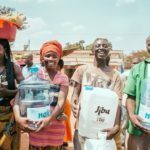 In 2015, they partnered with Mastercard Foundation to introduce and implement its corporate partnership model as a core program intervention. 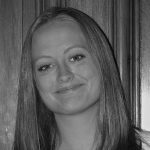 This initiation resulted in the successful integration of mentorship and skills development models and the collaboration with global and local partners such as Deutsche Bank, Sysco Labs, and St. Mark’s School. In 2017, they partnered with Mastercard in Sri Lanka to expand their programs for underprivileged women, helping an additional 250 women and girls with their scholarships, mentorship, and training. They also are continually learning from and sharing their experience at the global stage with other actors who are passionate about the issues around education. Last year, Manjula spoke at the UN General Assembly’s SDGs in Action panel regarding Educate Lanka’s role in creating partnerships with the business community to advance on the Sustainable Development Goals. He was also invited to the 2019 Global Talent Summit in Zurich in January to speak about the future of education and the urgency to leapfrog the poor and the marginalized into meeting the demands of tomorrow. In December 2018, Educate Lanka was represented at the Salzburg Global Seminar, discussing the importance of making social and emotional learning an integral part of global and national education policies and learning practices. In the summer of 2018, we saw Educate Lanka take something that could be devastating for them and their students, and turn it into a new opportunity for its beneficiaries. In July, we got the following message from Manjula about their annual global education visit to the US to attend the Global Citizenship Institute: To our dismay, [the students’] visit to the U.S. this year was denied due to reasons and decisions out of our control. 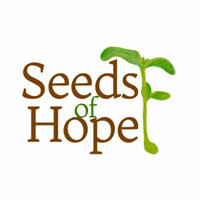 This would have been the third consecutive year of the program and previous two had been great successes. It was heartbreaking for everyone, especially for the five students who left their houses packed and ready hoping to board the plane to Boston only to be sent back home as their visas were denied [after two attempts]. A photo from a group session at their 4-day Global Citizenship Seminar – Sri Lanka in Kandy, Sri Lanka. But this setback didn’t stop them. Rather than letting the students miss out on the valuable learning opportunity, Educate Lanka turned things around and brought the Institute to them! To offer the very timely and important concept of Global Citizenship to a wider range of Educate Lanka Scholars, Educate Lanka replicated its own version of the Global Citizenship Seminar in Sri Lanka. Sixteen Educate Lanka Scholars from various parts of Sri Lanka, including Negombo, Kurunegala, Kandy, Monaragala, Mannar, and Vavuniya, ranging from the ages of sixteen to twenty-two from different ethnic, religious, and linguistic backgrounds, added to the diversity of the program. 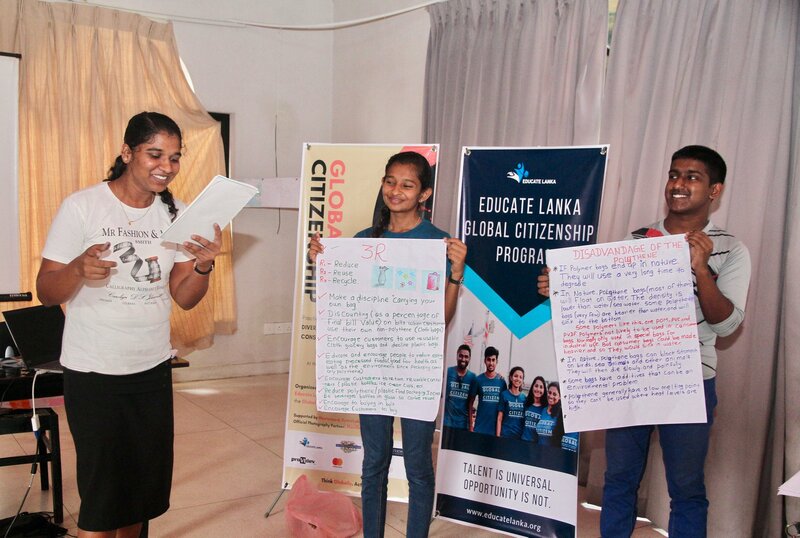 A few students doing a presentation at the Global Citizenship Seminar – Sri Lanka. More recently, toward the end of 2018, early 2019, Educate Lanka partnered with Ashoka Youth Venture. Ashoka activates youth as changemakers by working with educators, schools, parents, and companies to create an environment where young people can lead and practice the four core ‘changemaker skills’: Empathy, Collaborative Leadership, Fluid Team of Teams Culture, and Changemaking. 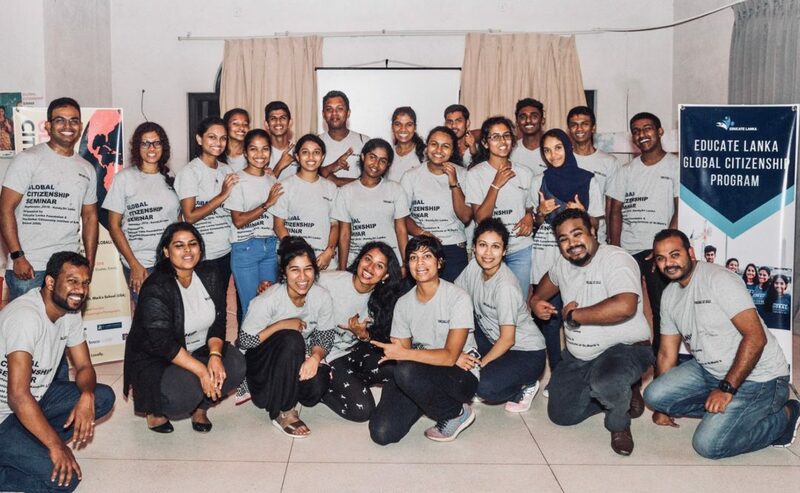 This was a training program by Ashoka to Educate Lanka staff, liaisons, volunteers, and student leaders to integrate Ashoka’s “changemaker principles” into Educate Lanka’s core program activities. On the left, we have Chathurika Senanayake, Communications and Program Coordinator of Educate Lanka, leading a discussion at the Ashoka training session in Kandy, Sri Lanka in January 2019. 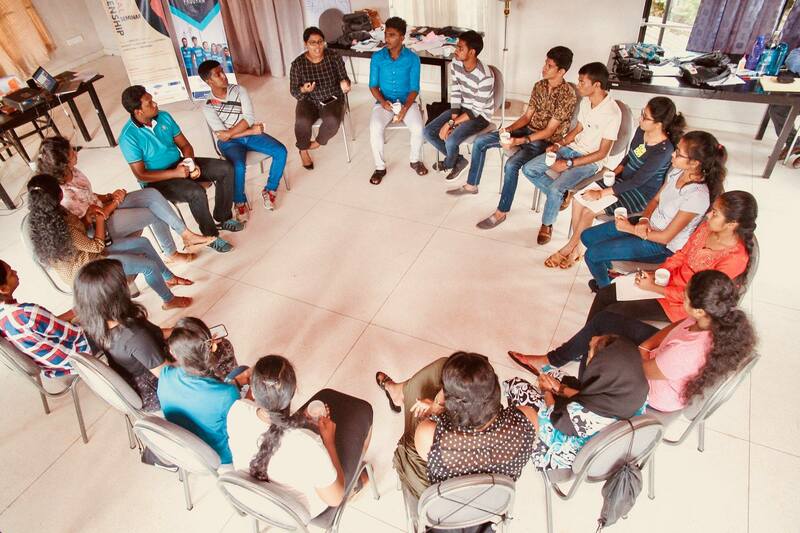 On the right, Mahishaa Balraj – Sri Lankan Coordinator of Ashoka Youth Venture, leading a seminar at the training session with Educate Lanka in Kandy, Sri Lanka in January 2019. As always, in spite of hardships or difficulties, we know Educate Lanka will continue to be innovative and creative with how they work to provide critical education opportunities to children and youth all over Sri Lanka. We look forward to seeing what they are going to do next! All pictures obtained via Educate Lanka. LEARN more about Educate Lanka here. DONATE directly to help support Educate Lanka, here or directly SPONSOR a student here.